Where have I been? There’s been an upgrade in my status at work recently, and I have been very busy with adjusting and keeping up with the tasks that naturally my hobbies are the first to go. Including cooking. I’ve been able to catch up though, and perhaps I can go back to this hobby which is dear to me. 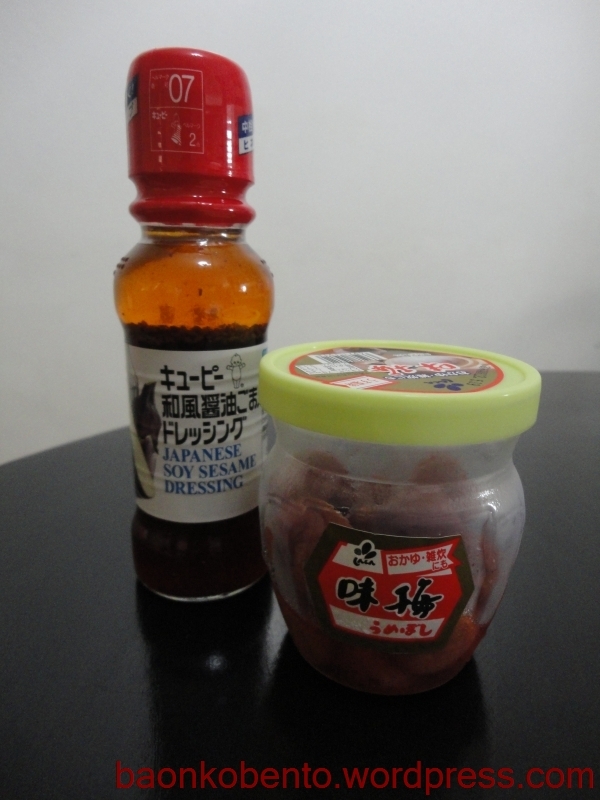 What I’m excited about is my purchase of umeboshi. I’ve been looking for this for a long time, and I was finally able to eat some at a Japanese restaurant at Little Tokyo in Makati. Of course I immediately wanted to buy some, to make into onigiri. I was able to find it in a Japanese grocery also at Little Tokyo. At first I only saw the big jars, which costs Php560 each, but I doubted that I can finish such a huge amount even though I really like ume. Luckily, there were smaller jars which costs only Php140. Here’s my beloved jar, along with a bottle of soy sesame dressing (Php150?). 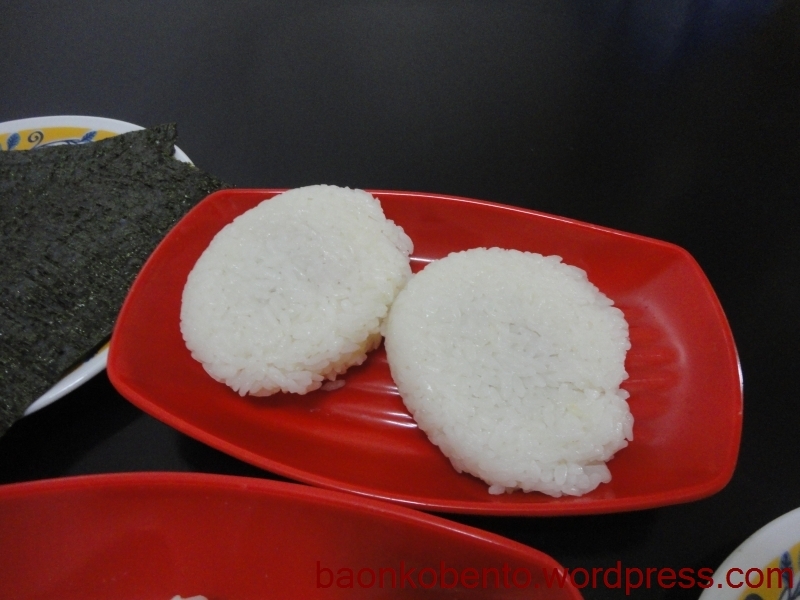 Today was my chance to make onigiri, and I decided to make a themed lunch out of it. 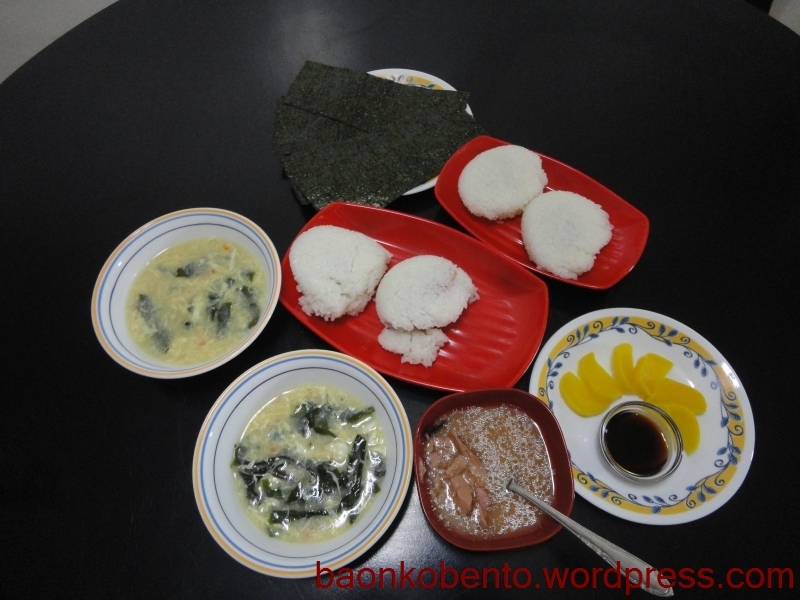 I made ume onigiri for myself, spicy tuna onigiri for The Man, some takuan, and an egg drop soup with wakame seaweed. Bits of the spicy tuna onigiri kinda fell apart a little at the plating. 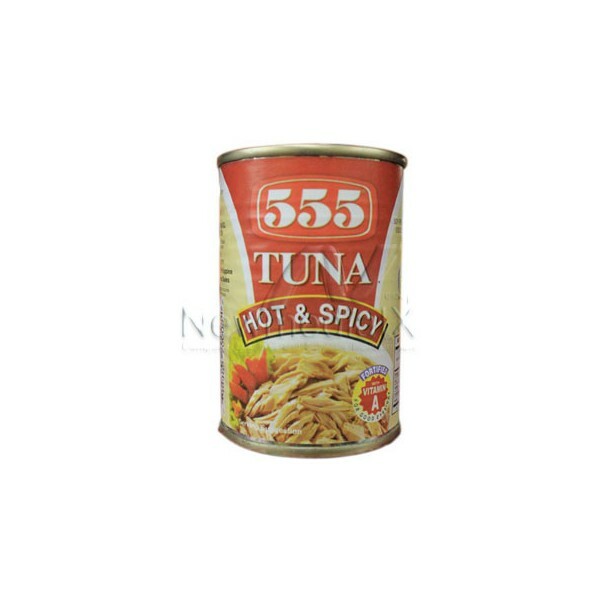 The spicy tuna is from a can of 555 Hot and Spicy tuna. There were quite a bit of it, and the left overs are in that small red square bowl at the bottom. Here’s a close up of the not-yet-wrapped-with-nori ume onigiri, which of course at this stage is not distinguishable from the spicy tuna onigiri. 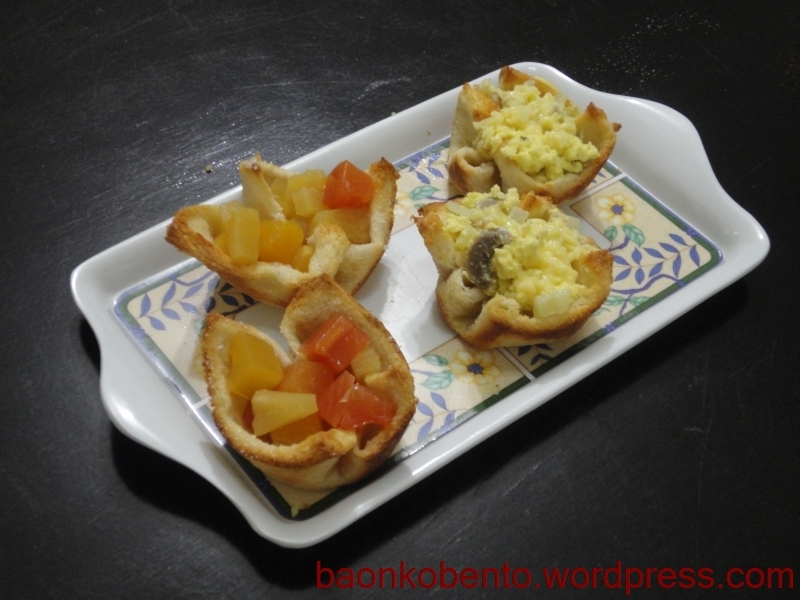 The takuan came from a long solid piece that I bought from Landmark Supermarket. It costs about Php200+, but it’s a pretty big piece so this will last a long time. You only ever eat so many slices at a time anyway. 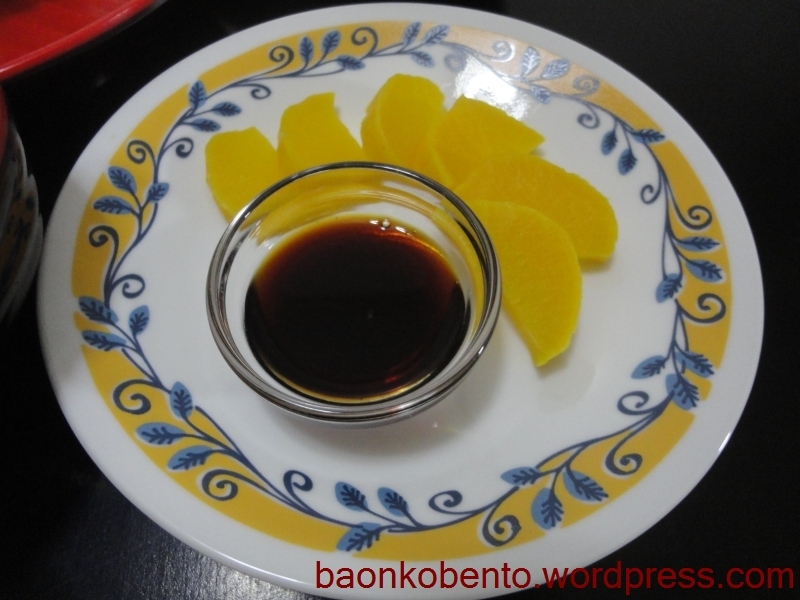 Here I used three slices halved, served with a small dipping sauce of Kikkoman soy sauce. 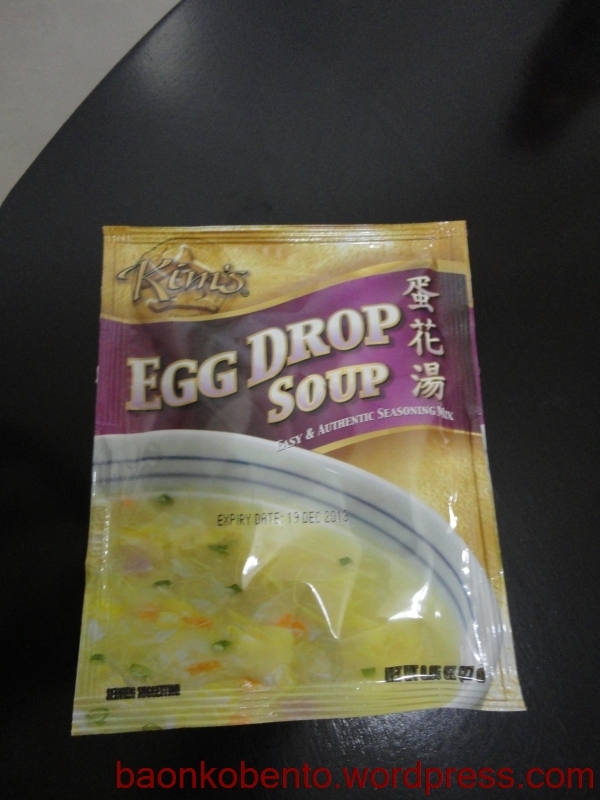 Lastly, I made an egg drop soup made from this gem. It’s really pretty easy to prepare. Just boil two cups of water, pour in the whole packet, and simmer for about a few minutes until all the powder has dissolved. Then I slowly poured in a lightly beaten egg while stirring the soup, to make the egg come out in strands. 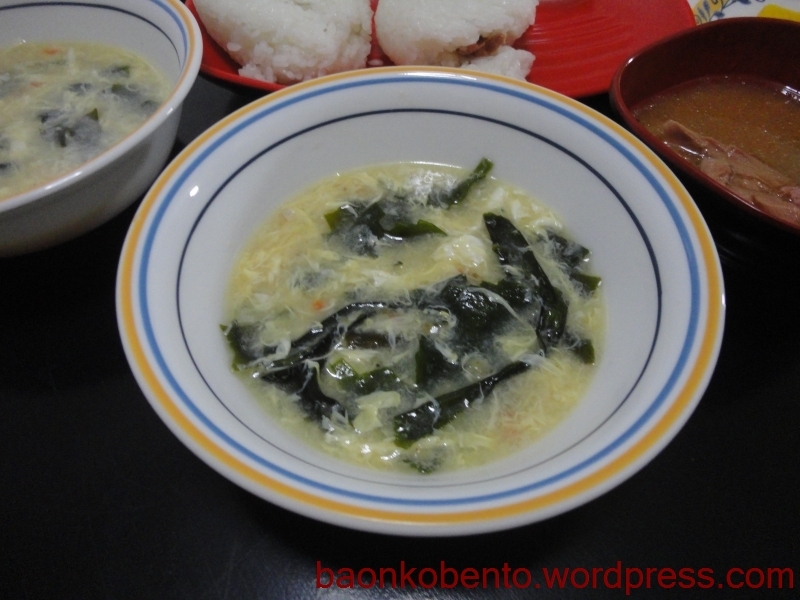 As a last minute inspiration, I decided to drop in about three pinches of dried wakame seaweed (bought from the Japanese grocery, Php 140 a small pack). It re-hydrated pretty well in the hot soup. After removing from heat, I put in a half teaspoon of sesame oil for added flavor. Not bad for a homemade lunch! This week I cooked up a batch of Chocolate Chunk cookies and as usual, I had to figure out what to do with the three yolks I had left over. Usually I would whip them up into a caesar salad dressing, but I didn’t have any salad materials on hand ready. I decided I’ll make some sort of snack from bread shaped into cups. I got this idea from Home Cooking Rocks. Basically I cut off the crusts off four slices of loaf bread and flattened them out with a rolling pin. I spread some melted butter on both sides then very carefully arranged them into a muffin pan. I actually tore the first slice slightly, but I plowed on ahead anyway. On two of these bread cups I sprinkled some white sugar. Into the oven they went (nicely preheated from baking the cookies) and baked until I could see the sides of the cups browned. Off they went onto a plastic tray to cool. In the meantime I heated up a pan with the leftover melted butter and a drizzle of olive oil. I sauteed half of a large white onion until limp, then added a small can worth of sliced button mushrooms. I left it to cook while I took those three leftover yolks, added another whole egg, about a fourth of a cup of fresh milk, a bit of shredded cheese, and some salt, pepper, and dried thyme and beat them all together. After the mushrooms and onions were in the pan for about five minutes, I poured in the egg mixture and scrambled them all up. I made sure to keep stirring the contents so the egg will cook evenly. It came out very yellow of course, with four yolks. 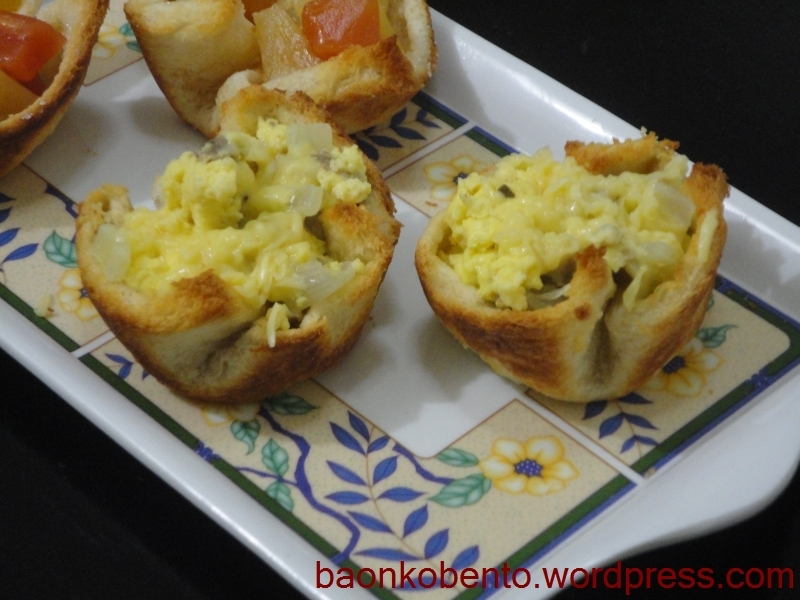 Once the egg was well cooked, I scooped out some, filled the two bread cups without the sprinkled sugar, and topped it with a bit more shredded cheese. Onto the other two cups I placed some sliced tropical fruit from Del Monte I think. I wanted to see how the bread cup idea would work with dessert type arrangement. 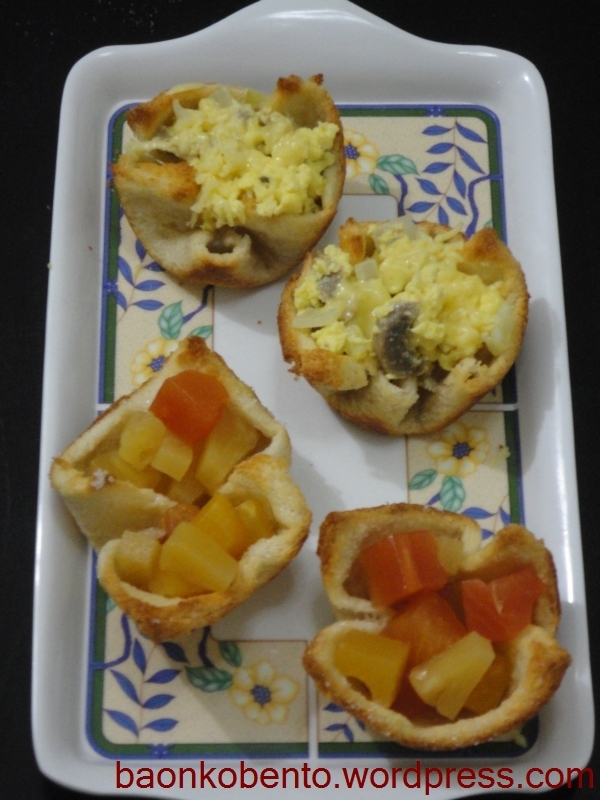 The mushroom-onion-egg bread cups were very tasty. It’s very filling even though it didn’t have any meat. I think this will do well as a side dish, or with enough bread cups it may even do for an entire meal. My husband liked this too. 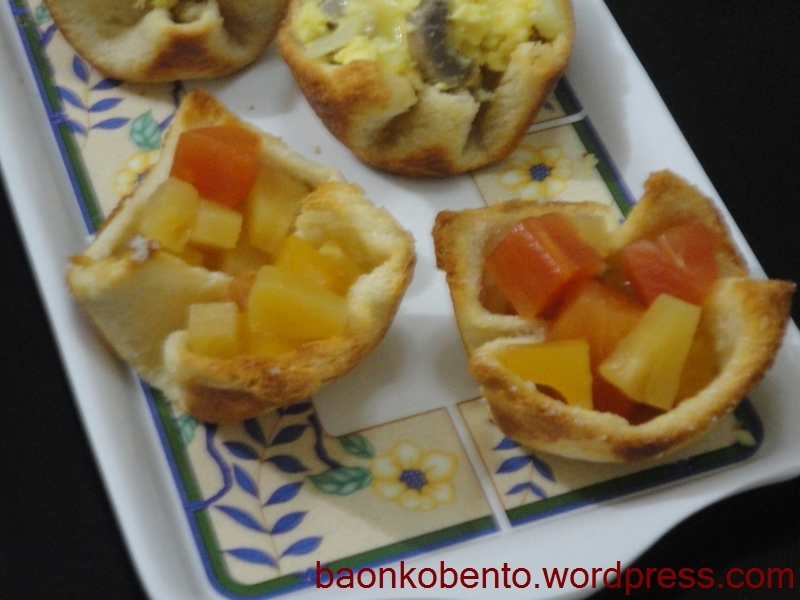 The fruit-filled bread cups were okay, but a little jolting. I guess it wasn’t really a usual arrangement since the fruit wasn’t baked into the bread. It wasn’t really bad per se, but I don’t think it will be repeated. I had a huge stock of eggs in the fridge, and I wanted to cut down on them a little to avoid them going bad. 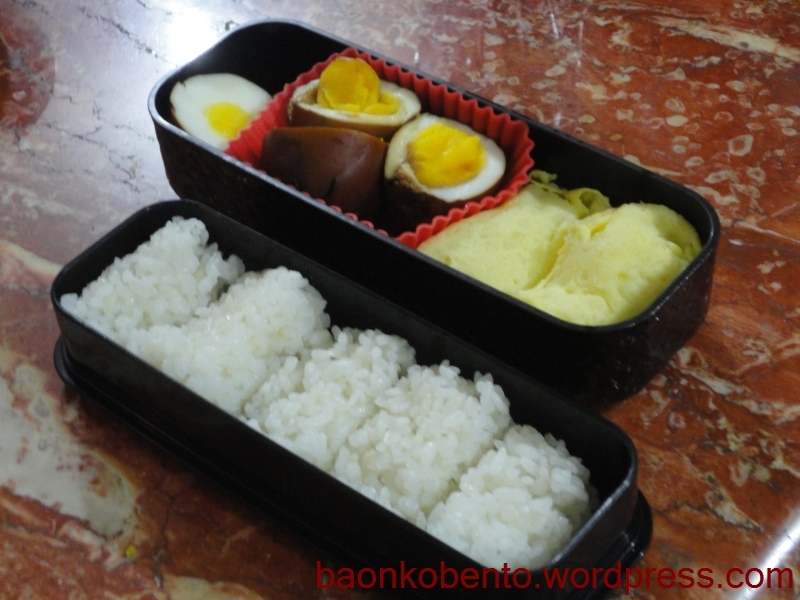 I decided to see what egg dishes are usually put in bento, and I found these two that sounded interesting: Shoyu Tamago from Just Bento, and Usuyaki Tamago from Just Hungry. 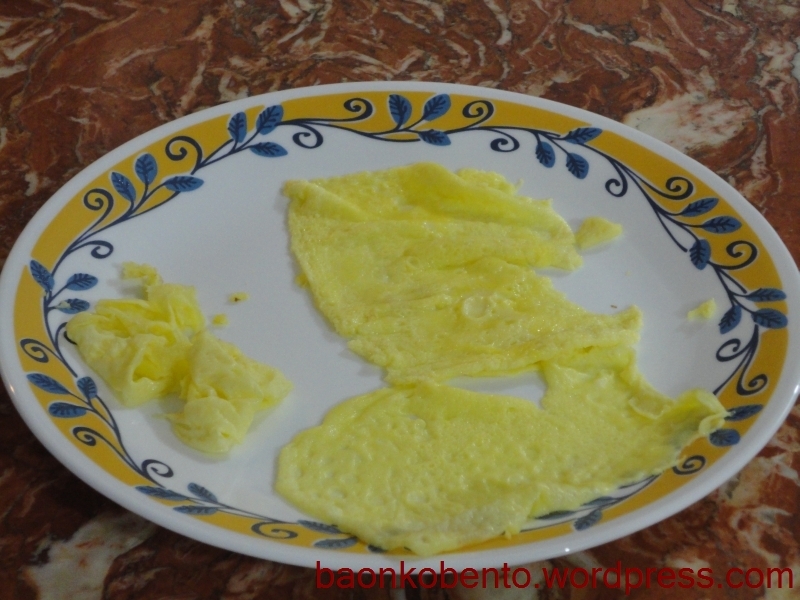 Usuyaki tamago is somewhat similar to pancakes, although much thinner and a bit sweeter. It may also be used as a wrap around sushi rice, and this is the avenue that I wished to pursue. Unfortunately, I found out the hard way that a good nonstick pan is essential to making thin pancakes. Here you’ll see that the first pancake stuck to the pan and got all torn up. 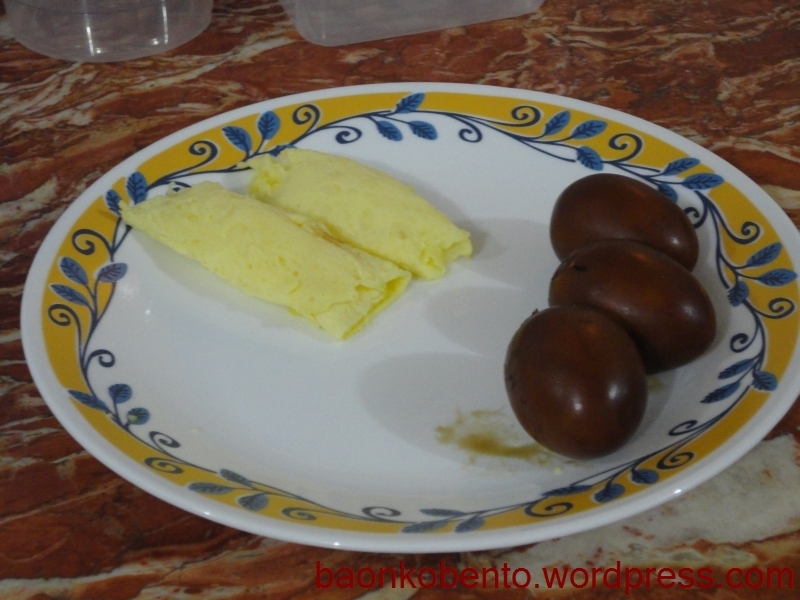 I switched to my relatively nonstickier tamagoyaki pan and was able to produce two relatively whole sheets of usuyaki tamago. I was a little bit more successful with the shoyu tamago. It sounds simple enough: hardboil some eggs, then roll them around in some soy sauce until the soy sauce mostly evaporates from the pan. Unfortunately, when I tried to follow the instructions for boiling the eggs, I ended up with softboiled eggs instead. I had to go back and reboil the eggs before going to the soy sauce stage. Here’s how the shoyu tamago came out, pictured with the formed usuyaki tamago wrapped around sushi rice. The moment I tasted the usuyaki tamago sushi I immediately resolved to buy a better quality nonstick pan, just to be able to taste this again. It. was. awesome! The shoyu tamago was equality delicious, and will definitely be repeated.